Hunt To Read: Trail Guide: What is A/B Testing? And How Can it Help HTR Authors? Trail Guide: What is A/B Testing? And How Can it Help HTR Authors? 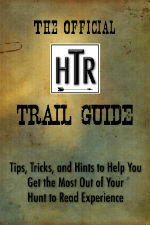 In the previous edition of the Hunt to Read Trail Guide, I quickly went through some of the cool things that you can do with the tools already available to you on the site. One of the tools that I mentioned is A/B testing. At the time, I'm sure some of you wondered just what the heck A/B testing was. Basically, A/B testing involves comparing two different versions of something, the "A" version and the "B" version. I first learned about it by reading Tim Ferriss's book, The Four Hour Workweek, in the context of setting small budgets for several different types of Google ads, and then choosing the one with the highest click-through rate. We're not talking about ads here per se, but if you're an author or publisher, online your cover is going to be one of the single most important marketing materials (if not the most important) that will help sell your book. Blurbs are also hugely important. Price can be too (hint, hint...I've said too much!). Google Adsense, Facebook Ads, and even I suppose sites like Goodreads could be potential avenues for A/B testing these various elements of your book presentation, but getting a representative enough sample could cost into the hundreds of dollars; that $10-20 per version adds up quickly. The beauty of Hunt to Read is that it's always free to list a book, and for the moment, access to our analytics is absolutely free. Even once we begin charging for premium memberships for access to analytics and other stuff we have in the works, the prices will be only a fraction of what you could end up spending on a single site.Once we have premium memberships, we expect to integrate A/B testing into them in a more comprehensive manner. For now, though, you're getting free analytics on all of your books. If you have two covers, or different titles, or blurbs, or even (I suppose) pen names that you're using, you can test out which version gets clicked through more, rated more, etc., all for absolutely free! Don't believe me? I've done that exact thing with my novella, Rogue. Here's the first hunt entry. Here's the second. Guess which one has the higher click through rate and more clicks? The second, for sure.In this instance, it doesn't take a genius to tell you which cover looks better--it's pretty obvious that the new one does. But even in this case, when I know going in that one option is better than the other, Hunt to Read lets me measure discreetly just how much better the new version is! How much will my click-through rate improve with the new cover? Though we don't quite have the traffic of Amazon just yet, statistics analysis indicates that once the sample size is large enough, you should be able to extrapolate out your Hunt to Read numbers to all of the various retailers. The same could easily be said of a blurb; though measuring blurbs is somewhat more subjective since it relies on ratings, you can also likely change your blurb and compare versions somewhat more easily. At the moment, the way to do so is to list multiple copies of your book in the system. As I said, eventually we will integrate A/B testing so that it's seamless for premium members. For now, as long as nobody abuses the privilege and lists a half-dozen copies of the same book with one-word description tweaks (PLEASE tell me I didn't just give some mischief-maker an idea there...), we're encouraging you to experiment however you want with multiple listings, covers, etc.It's all a part of the two ways that Hunt to Read can help you sell books as an author or publisher: directly, through the hunt and affiliate links on your books, and (perhaps more importantly) indirectly by providing honest feedback about your marketing materials like your cover, blurb, and presentation (for now--we're working on more) that can help you sell books to the millions of retailer customers who haven't quite heard of Hunt to Read...yet. Still not sure how to use A/B testing? Any ideas for how you're planning on using it in the future? Leave a comment below.